Despite all the government subsidies: "Fossil fuels may be out-innovating green tech"
Or is it because of all the government subsidies? The article is available here. A spate of articles this week points to the fact that new technologies in the fossil fuel industry are making it harder for alternative clean energy technologies to get a larger foothold. A New York Times article this week says new techniques allow drillers to tap oil and gas from a variety of "unconventional sources" that were once considered too difficult, a shift that changes the global picture on energy supply. . . . The first attempt to share the burden on Greece's €360 billion ($500.62 billion) of debt was deeply flawed, doing virtually nothing to restore the country's debt sustainability. The second, a 50% reduction in the face value of private investors' bond holdings, goes a lot further. But even after this level of debt relief, Greece will remain heavily indebted. The proposed July 21 deal involved a bond swap and debt buyback. In theory, bondholders were to take 21% haircuts, but in reality the deal only reduced Greek debt ratios upfront by 12 percentage points of gross domestic product. That was a drop in the ocean: The International Monetary Fund's most recent debt sustainability analysis saw debt peaking at 186% of GDP. Investors were to receive bonds backed by triple-A-rated collateral, effectively capping their losses. . . . The EU debt deal: Fatta la legge, trovato l'inganno. "Make the law and a way will be found around it." If you were thinking about getting a copy of the third edition of More Guns, Less Crime, you can now get it for only $10.96 for 472 pages. This book has about 200 pages of new material over the second edition and about 300 pages more than the first edition. I am pretty proud of this third edition. The economy grew slightly faster during the third quarter. But the newly released numbers mean that for the year GDP has only grown at an incredibly slow 1.4 percent, barely keeping pace with population growth. The change in per capita GDP so far this year is essentially zero. Normally the more severe the recession, the faster is the recovery. 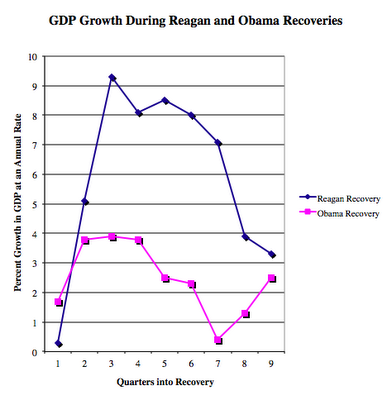 During the Reagan administration, for same three quarters, GDP grew at 4.8 percent. Since the Obama recovery started in June 2009, GDP growth has averaged 2.5 percent, compared to 6 percent over the same time period under Reagan. The quarterly growth rates for the two recoveries are available here. Obviously, more people working would result in more income. The slow GDP growth is tied to the continued record high unemployment. Unemployment has remained at least at 9 percent for 27 months and counting, a post World War II record. While the unemployment rate during the recession in the early 1980s went higher, reaching 10.8 percent, the high rates did not last as long, staying above 9 percent for a relatively short 19 months. . . . Newest National Review piece: Is the Public Sector Hurting? ‘It’s very clear that private-sector jobs have been doing just fine; it’s the public-sector jobs where we’ve lost huge numbers, and that’s what this legislation is all about,” Democratic Senate majority leader Harry Reid claimed last week. Senator Reid is simply wrong: The private sector has suffered from much deeper job cuts than public-sector workers have faced. Obviously, Americans are hurting, with some 7 million losing their jobs since the start of the recession. And that doesn’t include the 7.2 million people who should have entered the work force over the same time period. But the pain hasn’t been in the public sector. The only group of workers who are “doing just fine” are those working for the federal government, where employment has increased by 11 percent since the start of the recession. Both private-sector and state- and local-government employment have fallen. While private-sector employment has recovered slightly from 7.5 percent drop it originally suffered, it is still down 5.4 percent. . . . The first estimate for the 3rd quarter of 2011 is available here. So far this year GDP growth has only been 1.4 percent. During the same period during the Reagan recovery, the annual rate of GDP growth was 4.77 percent. The two periods of time are from the beginning of 1983 to the beginning of 1985 and from the third quarter of 2009 to now. In keeping with his new campaign theme of “we can’t wait,” President Obama today will roll out a plan to put more money in the pockets of some of the nation’s 36 million student loan recipients. Obama has broad latitude in this area – certainly broader than the first two parts of his western campaign trip, underwater mortgages and subsidies for hiring veterans – because one of his early legislative initiatives was to have the federal government take over the student lending business in America. Obama argued for the measure in 2009 as a cost-savings initiative, saying that the old system of privately issued, government secured loans reduced the amount of available money for needy students and also prevented the feds from making the system more efficient. But Obama is now seeking to use that new power to obtain a taxpayer-financed stimulus that Congress won’t approve. The idea is to cap student loan repayment rates at 10 percent of a debtor’s income that goes above the poverty line, and then limiting the life of a loan to 20 years. . . . The Atlantic notes: "Obama's Student-Loan Order Saves the Average Grad Less Than $10 a Month"
Why should the government just be writing off student loans? -- He will clear the way for borrowers with direct government loans and government-backed private loans to consolidate their balances. The White House estimates that this will cut the effective interest rate on student loans by up to 0.5%. 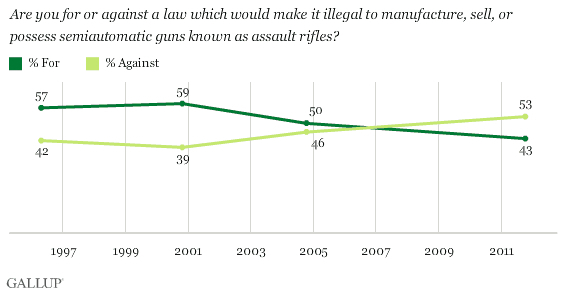 Gallup's annual gun control survey is out and available here. Interestingly, support for gun control has fallen more among women and those with a college education. 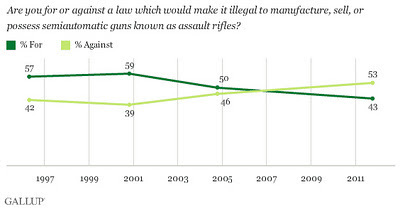 Support for gun control is falling across the board. 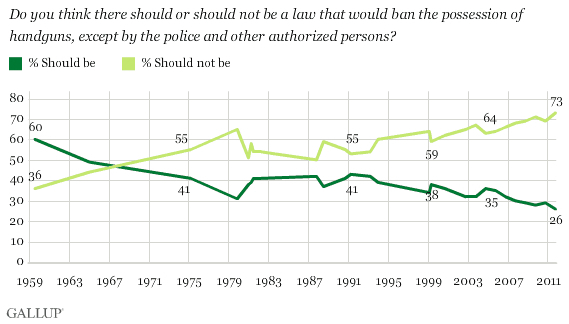 Handgun bans are no longer getting much support. The Rasmussen Consumer Index, which measures the economic confidence of consumers on a daily basis, slipped a point on Wednesday to 65.8. Consumer confidence shows little change from last week, but is down three points from a month ago and two points from three months ago. The index is now 18 points lower than the level measured in the beginning of the year. Seventy percent (70%) of consumers believe the U.S. economy is currently in a recession while only 14% disagree. . . .
Rasmussen's employment index is still pretty abysmal. It is still lower than than the five of the preceding eight months. Argentina ordered oil, gas and mining companies to repatriate all export revenue as the government struggles to stem accelerating capital flight from South America’s second-biggest economy. President Cristina Fernandez de Kirchner, in her first move since winning re-election on Oct. 23, changed a 2002 decree requiring companies such as Repsol YPF SA and Pan American Energy LLC to keep at least 30 percent of their export revenue in the country. Today’s decree, published in the official gazette, applies to future sales. The decision by Fernandez, who nationalized the $24 billion pension fund industry and called for a limit on purchases of farmland by foreigners, is part of an effort to slow capital flight estimated at $3 billion per month that is draining central banks reserves. The policy may make it harder to attract foreign direct investment to Argentina that the United Nations estimates fell 30 percent in the first half of the year. . . .
UNBELIEVABLE: "Worst Electric Car Ever Made?" Here is the original piece by Warren Meyer. The Fisker Karma electric car, developed mainly with your tax money so that a bunch of rich VC’s wouldn’t have to risk any real money, has rolled out with an nominal EPA MPGe of 52 in all electric mode (we will ignore the gasoline engine for this analysis). Not bad? Unfortunately, it’s a sham. This figure is calculated using the grossly flawed EPA process that substantially underestimates the amount of fossil fuels required to power the electric car, as I showed in great depth in an earlier Forbes.com article. In short, the EPA methodology leaves out, among other things, the conversion efficiency in generating the electricity from fossil fuels in the first place [by assuming perfect conversion of the potential energy in the fuel to electricity, the EPA is actually breaking the 2nd law of thermodynamics]. As I calculated in my earlier Forbes article, one needs to multiply the EPA MPGe by .365 to get a number that truly compares fossil fuel use of an electric car with a traditional gasoline engine car on an apples to apples basis. In the case of the Fisker Karma, we get a true MPGe of 19. This makes it worse than even the city rating of a Ford Explorer SUV. . . . While Fisker refused to appear on the same show with Meyer, Fisker's defense is provided here. Its defense is that well this is the way the EPA measures MPG for electric cars. The defense doesn't seem to directly address Meyer's points. "At the outset of the creation of the euro in 1999, it was expected that the southern eurozone economies would behave like those in the north; the Italians would behave like Germans. They didn’t," Greenspan said. "Instead, northern Europe fell into subsidizing southern Europe’s excess consumption, that is, its current account deficits." Greenspan predicts that as the south's fiscal crisis deepens, the flow of goods from the north will stop altogether and southern Europe's standard of living will go down. "The effect of the divergent cultures in the eurozone has been grossly underestimated," he added. "The only way to have several currencies from divergent nations lumped together is if they are culturally close, such as Germany, the Netherlands and Austria. If they aren’t, it simply can’t continue to work. . . .
. . . the Government Accountability Office (GAO) reports that the Executive Office of the President violated federal law, but that’s the conclusion the GAO released in a report this month, after reviewing bilateral talks with the Chinese government hosted by the White House Office of Science and Technology Policy (OSTP). The White House Office of Legal Counsel (OLC) disputes GAO’s analysis, arguing that the law does not constitutionally apply to the OSTP's diplomatic activities. The disagreement stems from meetings this past May in which officials from the OSTP met with representatives of the Chinese government to discuss technology innovation and economic issues.
. . . the GAO "conclude[d] that OSTP’s use of appropriations to fund its participation in the Innovation Dialogue and the [economic issues] violated” a section of the Department of Defense appropriations bill that became law in April. "None of the funds made available by this division may be used for the National Aeronautics and Space Administration or the Office of Science and Technology Policy to develop, design, plan, promulgate, implement, or execute a bilateral policy, program, order, or contract of any kind to participate, collaborate, or coordinate bilaterally in any way with China or any Chinese-owned company unless such activities are specifically authorized by a law enacted after the date of enactment of this division." Is Biden trying to get a conservative journalist's press privilege revoked? Joe Biden’s office has complained to the Senate press gallery about a confrontation the vice president had with a conservative journalist last week on Capitol Hill. Biden aides asked whether Senate rules were broken in the wake of the contentious exchange between the vice president and the reporter. Jason Mattera, who works for Human Events, a conservative magazine, used a pretext to catch Biden off guard in a Senate hallway and grill him on claims the vice president has made about jobs legislation. Biden’s office has also contacted the standing committee of correspondents, which oversees the gallery, regarding whether Mattera broke the rules by ambushing him. Heather Rothman, the chairwoman of the gallery’s standing committee, said the matter is under review. . . . . The ruckus seems to be over the fact that the reporter shook Biden's hand, somehow deceiving Biden into believing that the reporter was just a normal citizen asking questions. After watching the video, there are a couple of points. There were lots of press hanging around there, including movie cameras. Whether it was a reporter or a private citizen asking questions, Biden would have known that he was on the record. Would the media be all over this if it involved a "main stream" reporter? A vast majority of businesses predict the U.S. economy will grow only slightly in 2011, a more negative outlook from July when most called for more robust improvement, according to a survey of U.S. companies released Monday. The National Association for Business Economics, in its quarterly industry survey of 70 corporate economists, found companies have curtailed plans to hire amid predictions for continued sluggish growth. Yet there were some bright spots, as the survey found significantly more firms reporting rising sales than declining sales. “Expectations for growth deteriorated quite significantly but the bulk of respondents are not predicting a recession,” said Shawn DuBravac, chief economist for the Consumer Electronics Association and one of the authors of the report. The economists surveyed by the NABE expect tepid growth, with 82% predicting the gross domestic product will increase by 2.0% or less this year from 2010, and 3% said the economy would in fact contract. That’s a big swing from July when 76% said GDP would grow by 2.1% or more. Those projections compare with 2.5% to 3.0% range the Federal Reserve forecast in June for 2011 GDP growth. The Commerce Department is set to release initial GDP figures for the third quarter on Thursday. Economists surveyed by Dow Jones Newswires forecast a 2.7% increase. “The economy will grow, just less than expected three months ago,” DuBravac said. . . .
Just 29% of respondents said they expect employment will increase in the next six months–the lowest number since January 2010. The survey showed 12% of respondents expect the labor market to weaken further while most say it will remain in its current state. . . .
Another US Debt Downgrade coming soon? We expect a moderate slowdown in the beginning of next year, as two small policy shocks—another debt downgrade and fiscal tightening—hit the economy. The “not-so-super” Deficit Commission is very unlikely to come up with a credible deficit-reduction plan. The committee is more divided than the overall Congress. Since the fall-back plan is sharp cuts in discretionary spending, the whole point of the Committee is to put taxes and entitlements on the table. . . . The credit rating agencies have strongly suggested that further rating cuts are likely if Congress does not come up with a credible long-run plan. Hence, we expect at least one credit downgrade in late November or early December when the super Committee crashes. For election results go here. Amazingly the Lieutenant Governor and Secretary of State races only had Republicans running against each other. Hurricane Katrina has really changed the state's electoral politics dramatically. Smith does a great job summarizing the problem. My question is what do all the great Democrat investors in the project, such as Al Gore, have to say?
. . . Are you kidding me? Our president gave our hard-earned money to Henrik Fisker to build his politically correct $97,000 electric sports car? You know, the $529 million loan that Vice President Joe Biden claimed was a bright new path to thousands of American jobs. Two years later, only 500 jobs have been created — at a cost of about $1.1 million per job. But wait, it gets better, well actually, worse. Much worse. Those 500 great American jobs are in Finland. ABC network chief investigative reporter Brian Ross tells me Mr. Fisker told him: "There was no contract manufacturer in the U.S. that could actually produce our vehicle. They don't exist here." Apparently he's never heard of Detroit and didn't know we have a few available empty auto plants in "move-in" condition. He apparently didn't know we have a "few" well-trained, excellent autoworkers available, too. And finally, as if he hadn't spread enough salt into our wounds, Mr. Fisker finished with: "We're not in the business of failing; we're in the business of winning. So we make the right decision for the business. That's why we went to Finland." Why didn't he get the $529 million from Finland then? Maybe he and his cars should just stay there, after he pays us back. . . .